Rose Coschignano/Pipe Dream Photographer Students and faculty gather in the University Union to discuss incarceration and prison reform. According to the World Prison Brief, the United States has the highest incarceration rate in the world, a statistic that students and faculty discussed on Thursday in the Mandela Room. 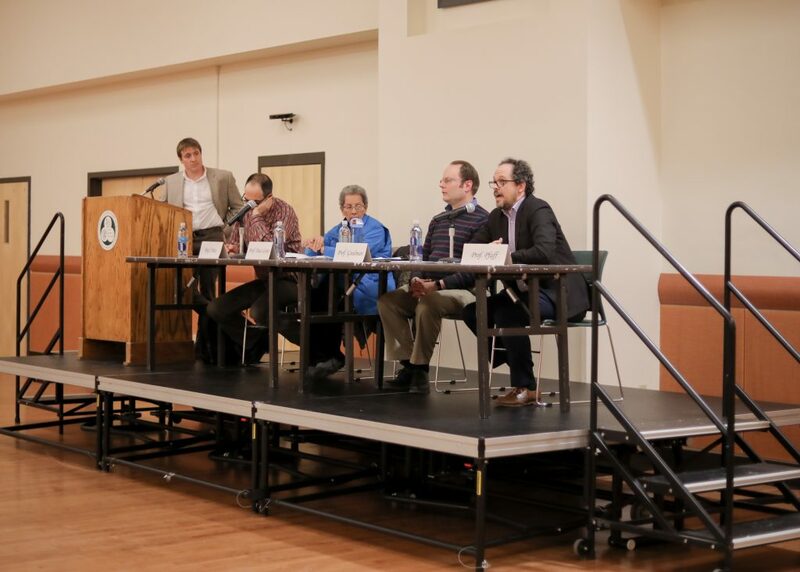 The talk, which focused on prison reform and incarceration in the United States, featured a panel of four professors who discussed their research on imprisonment. Anthony Reeves, associate professor of philosophy and director of the philosophy, politics and law program at Binghamton University, said he organized the event to tackle questions on criminal law and the social issues that surround it. “I think it is safe to say that, in all of U.S. history, it has been clear to many across the political spectrum that these sorts of questions cannot — given the current criminal justice state — be avoided,” Reeves said. John Pfaff, professor of law at Fordham University and a panelist, described his research on sentencing laws and their effects on incarceration. Charles Goodman, professor of philosophy and Asian and Asian American studies at BU, said the current criminal justice system often fails to secure justice and casts criminals as less than human. The panelists also discussed private prisons’ profit margins, the natural or environmental causes behind crimes and violence and the conditions incarcerated people endure while awaiting trial. Juanita Díaz-Cotto, professor of sociology, women’s studies and Latin American and Caribbean area studies (LACAS) and director of the LACAS program at BU, said it is also important to recognize gendered biases within criminal law. According to Díaz-Cotto, men are more likely to be incarcerated for violent crimes, while women are more often incarcerated for drug-related crimes. Joshua Price, professor of sociology at BU, spoke about the conditions and challenges of local jails, such as the Broome County Jail, which has seen eight deaths in the last seven years, leading to community protests. Leisa Rockelein, a junior triple-majoring in philosophy, political science and philosophy, politics and law, said she thinks the incarceration panel was relevant to her studies and future career path. Melissa Brosnan, a junior majoring in philosophy, politics and law, said she was interested in hearing different perspectives on what incarceration could look like in the U.S.. According to Arsenije Markicevic, a junior quadruple-majoring in philosophy, physics, economics and philosophy, politics and law, the panelists connected their discussion to the dehumanization of incarcerated people several times throughout the event. “The fact that victims believed that criminals were punished too harshly, show that the United States’ prisons and criminal justice system is flawed and is too cruel and that criminals deserve to have their rights as humans upheld more,” Markicevic said.